Oulu is a city and municipality of inhabitants in the region of Northern Ostrobothnia, Finland. 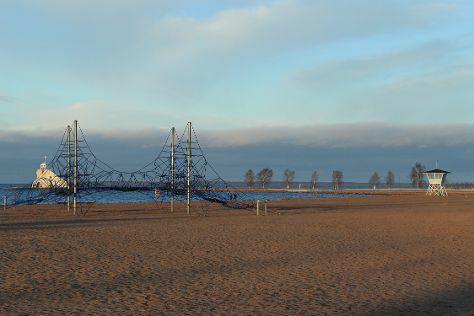 Get outdoors at Nallikari Beach and Hupisaaret Park. When in Oulu, make a side trip to see Sampo Icebreaker in Kemi, approximately 1h 30 min away. Next up on the itinerary: contemplate the long history of Kauppahalli, enjoy some diversion at Tietomaa, examine the collection at Oulun Automuseo, and pause for some photo ops at Toripolliisi. To see photos, traveler tips, other places to visit, and other tourist information, read Oulu trip maker website . Helsinki to Oulu is an approximately 3.5-hour flight. You can also take a train; or drive. Traveling from Helsinki in April, things will get slightly colder in Oulu: highs are around 5°C and lows about -3°C. Finish your sightseeing early on the 16th (Tue) to allow enough time to drive to Jyvaskyla. Jyväskylä is a city and municipality in Finland and in the western part of the Finnish Lakeland. On the 17th (Wed), examine the collection at The Alvar Aalto Museum, brush up on your military savvy at Finnish Air Force Museum, get a new perspective on nature at Natural History Museum of Central Finland, then tour the pleasant surroundings at Tourujoen luontopolku, and finally test your team's savvy at popular escape rooms. For traveler tips, photos, more things to do, and other tourist information, you can read our Jyvaskyla trip planning website . Getting from Oulu to Jyvaskyla by car takes about 4.5 hours. Other options: fly; or take a train. In April in Jyvaskyla, expect temperatures between 7°C during the day and -3°C at night. Wrap up your sightseeing on the 17th (Wed) early enough to drive back home.